The death toll from two recent California wildfires dropped to 88 people on Monday, after the Butte County sheriff announced that remains thought to be separate cases were “proven by DNA” to be the same person. The Camp Fire in Northern California destroyed an entire town in less than a day and killed at least 85 people, making it by far the deadliest fire in the state’s history. The death toll from California’s deadliest wildfire on record dropped back to 85 people on Monday, after authorities discovered that separate bags of remains recovered from the Camp Fire were “proven by DNA” to be the same case. That shred of good news came as workers continue to clear debris and sift for remains in the area of Northern California hit by the Camp Fire. Eleven people are still missing, according to the Butte County Sheriff’s Office, so it’s possible the number of victims could still rise. Authorities announced on November 25 that the fire, which had raged for over two weeks in the foothills of the Sierra Nevada, was 100% contained. The blaze scorched 153,336 acres – an area larger than the city of Chicago. This year to date, 7,989 fires have burned across California, fuelled by hot, dry conditions and aggressive winds. The causes of the Woolsey and Camp Fires are still under investigation, but sparking power lines may have played a role in the Camp Fire. 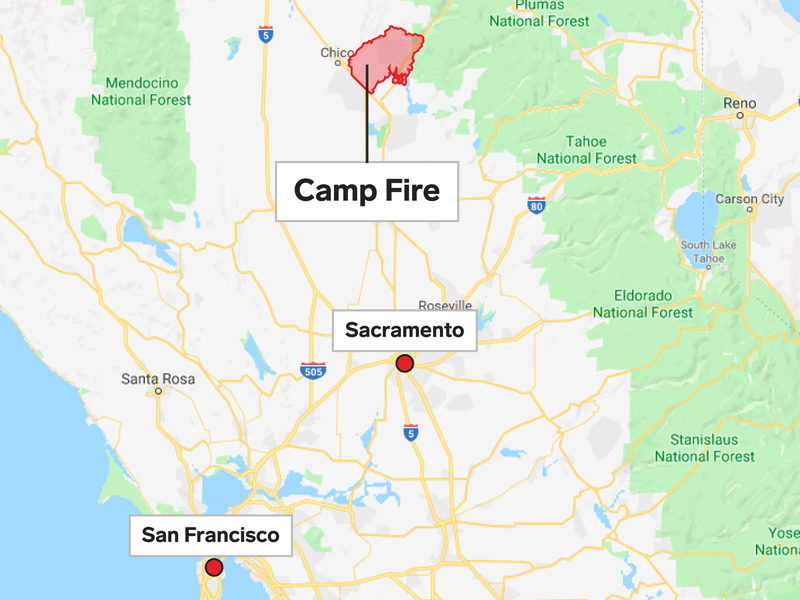 The Camp Fire moved at a deadly pace – about 80 football fields per minute – after breaking out on the morning of November 8. The 27,000-resident town of Paradise was in flames within hours. 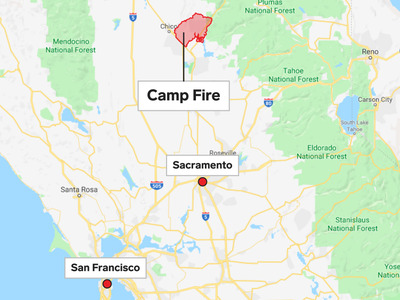 Business Insider/Cal FireThe Camp Fire burned about 200 square miles in Northern California from November 8 to November 13. The fire’s quick spread made successful evacuations nearly impossible. Before this, California’s deadliest blaze was a 1933 fire that broke out in LA’s Griffith Park. It killed 29 laborers who were caught unprepared to battle the flames. The Camp Fire’s death toll is almost triple that. More than 13,900 homes and 500 businesses were destroyed, along with over 4,200 other buildings, making the Camp Fire the most destructive wildfire in California’s history in terms of structures lost. The Butte County Sheriff’s office is working with anthropologists from California State University at Chico to help identify bone fragments among ash in the area. Some residents have given cheek swabs to help officials identify their relatives’ remains. 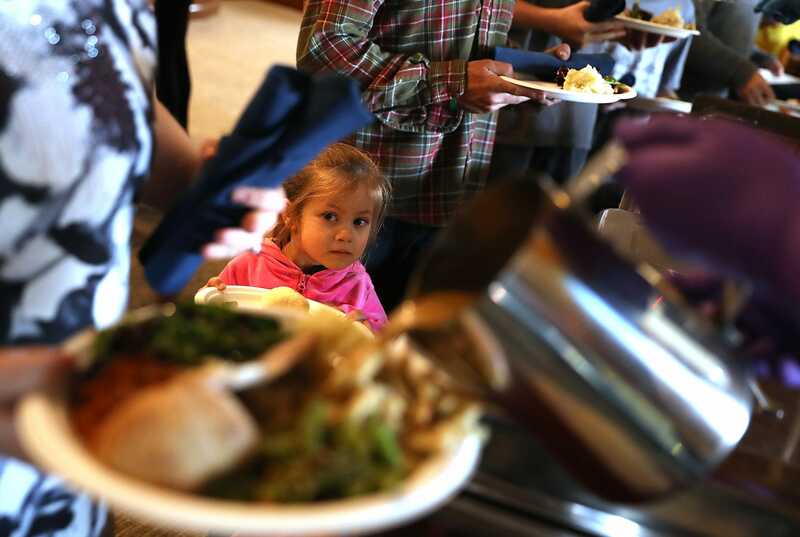 Justin Sullivan/Getty ImagesA young Camp Fire evacuee waits in line to receive a free Thanksgiving meal at Sierra Nevada Brewery on November 22, 2018 in Chico, California. But on Twitter, Trump blamed the fires on poor forest management and threatened that there may be “no more Fed payments.” (The federal government oversees more than 40% of California’s land.) When visiting, Trump also criticised Californians for not doing more raking. Trump suggested that’s how Finland prevents forest fires, but the president of Finland said it’s not true. 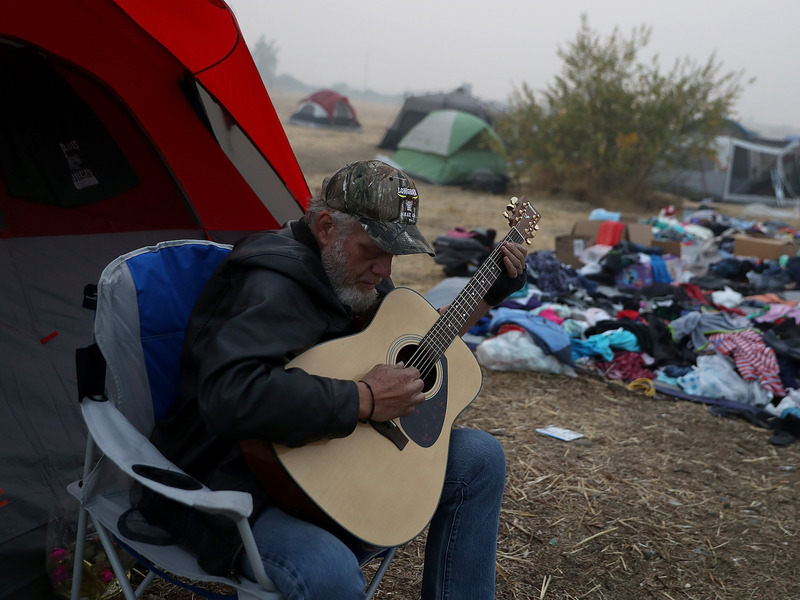 Justin Sullivan/Getty ImagesCamp Fire evacuee Kelly Boyer plays guitar in front of his tent next to a Walmart parking on November 16, 2018 in Chico, California. Over $US20 million in federal aid has been distributed so far, according to the agency, mostly in the form of hotel vouchers and other housing assistance. Smoke from the Camp Fire made it difficult for people in many parts of Northern California to breathe for nearly two weeks.Soot and chemicals released from the flames blanketed wide swaths of the state in a grey haze. 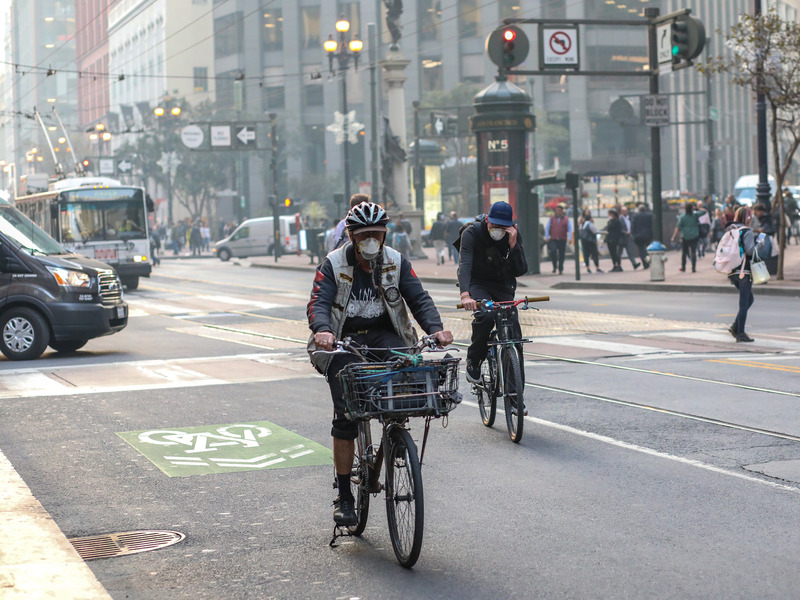 Katie Canales/Business InsiderSome people in San Francisco have donned masks to protect their lungs. In the days after the fires broke out, the Environmental Protection Agency described the air throughout much of the Bay Area as “unhealthy” or “very unhealthy” to breathe. 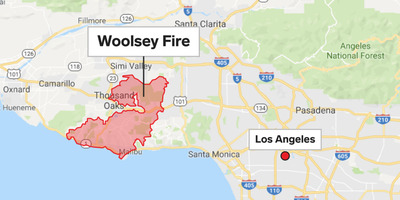 Business Insider/Cal FireThe Woolsey Fire burned more than 96,000 acres around Los Angeles. 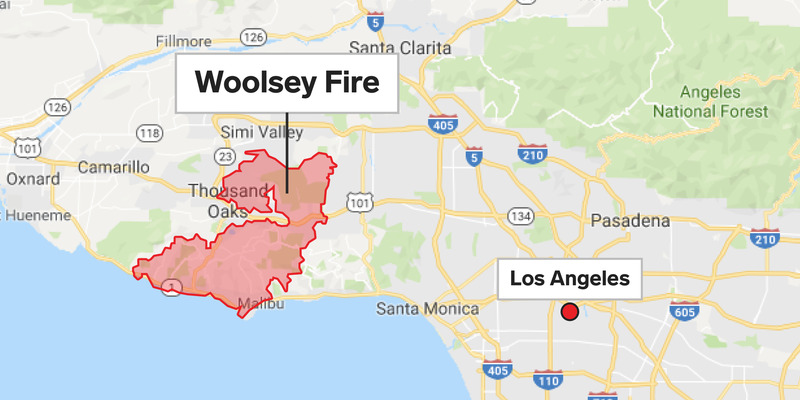 The Woolsey Fire, fuelled by fierce Santa Ana winds, destroyed 1,500 structures, mostly homes. The fire was marked as 100% contained on November 21. 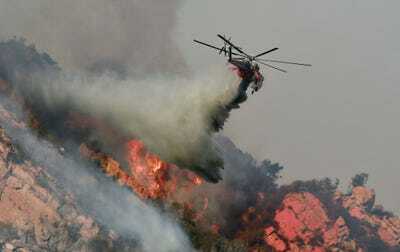 Sandy Huffaker/Getty ImagesFirefighters battle a blaze at the Salvation Army Camp in Malibu, California. You can view find more information and resources on the Ventura County Emergency Information site, the Ventura County Recovers site, and LA County’s Woolsey Fire site. Sandy Huffaker/Getty ImagesA helicopter drops flame retardant on the Woolsey Fire. 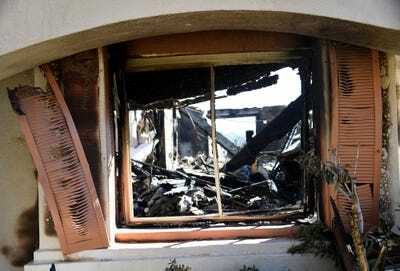 Kevork Djansezian/Getty ImagesA destroyed house in Thousand Oaks, California. 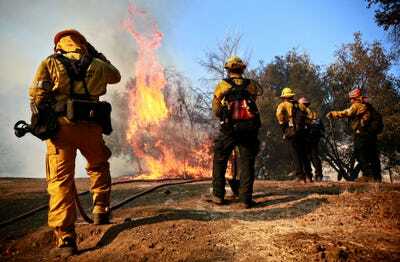 The flames in Southern California have been fuelled by hot, dry conditions and spread by Santa Ana winds, which tend to blow in from the desert in the fall months.